There is a larger number of “peripheral genes” that drive disease through cellular networks in specific cell types. These peripheral genes can be placed into biologically relevant categories based on these cell types, as has been demonstrated through cell-specific epigenetic maps (here, here, here, here). There is an even larger number of peripheral genes and disease-associated variants – essentially all regulatory variants active in relevant cell types – that contribute non-zero effects, but that cannot be easily categorized based on known biology. This is the new concept, which the authors termed “omnigenic” to emphasize that “most heritability can be explained by effects on genes outside core pathways”. It is important to note, as the authors do in the very first paragraph of the manuscript, that the ‘‘infinitesimal model’’ of complex trait genetics has been around for nearly 100 years. Further, many have shown that complex traits are highly polygenic. In other words, the omnigenic model is an extension of the infinitesimal model, differing primarily in the mechanistic hypothesis as to how a large number of genes with small effects act to influence disease: via regulatory networks that act outside of core genes. For the remainder of the blog, I focus on the implications for drug discovery and development. I want to move away from the debate on whether GWAS should or should not continue, as I find this debate entrenched in personal perspective more than objective reasoning. (“I always told you that GWAS was worthless! This paper proves it.” Uggh.) Similarly, I will not venture into the fray of “fraction of heritability explained”, as I don’t believe this is the critical question for drug discovery and development. Even if core genes explain a small fraction of heritability, they provide important mechanistic insight into disease. The real value for drug discovery is to understand the quantitative relationship between an allele’s effect on gene function and clinical phenotype. I believe the conclusions from this paper are consistent with three complementary applications for drug discovery and development. The first two applications have been discussed in this blog before. I build on the concept of “core genes” and “peripheral genes”, as well as highlight the importance of understanding the biological impact of disease-associated variants in core genes. The third application is around “circuit pharmacology”, a new area that I believe could disrupt the traditional reductionist approach to target-based screens. (1) Core genes with an allelic series. I have discussed this at length in this blog. What I will say here is that the model proposed by Pritchard and colleagues supports this view. They raise important questions about how to define core genes, and propose solutions that I find very sensible (e.g., genes that harbor common variants with large clinical or biological effects; genes with a series of disease-associated alleles). In this blog, I want to underscore that a missing piece of information is the need to understand the biological (or functional) impact of disease-associated variants, including those from GWAS. For most disease-associated variants, the effect on biological function is not yet known. This is a major gap that needs to be filled if genetics is to be used in drug discovery and development. 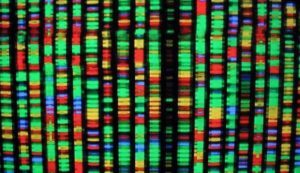 Without understanding biological function, it is impossible to decipher whether genetics is valuable or not for drug discovery and development. The figure below is a simple attempt to put genes into one of four quadrants based on clinical and biological / functional effects of the disease-associated variants. Based on the model of Pritchard and colleagues, a small number of core genes would fall into the “Go” quadrant. 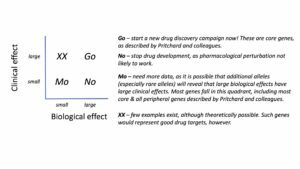 (I use “go”, as the term signals an aggressive approach to drug discovery is warranted.) Most genes today, however, fall into the “Mo” quadrant, including both core and peripheral genes. (“Mo” is for more information is needed…yes, I am trying to be clever.) Over time, as new genetic and biological information is gathered, core genes (the wheat) will be separated from other genes (the chaff). Thus, it is essential to think quantitatively about the biological effect of a disease-associated variant, not just the fraction of heritability explained by the disease-associated variant. This distinction is what seems to confuse a lot of people. As I recently attempted to do for the TNFSF13B gene / BAFF protein (see blog here), drug hunters need to know the magnitude of effect of perturbing a target to decide if it is a good drug target or not. As an aside, a pet peeve of mine is when someone comments: “I don’t care about variants with odds ratios of 1.10.” This is a nonsensical statement, unless you know the biological effect of the disease-associated variant. As an extreme example: consider a variant that completely obliterates gene function and has small clinical effect. This observation would effectively rule-out a target for pharmacological perturbation. Oh naïve drug hunter, you should care about this finding! (2) Core and peripheral genes that implicate biological pathways. I have also used this blog to discuss the genes to pathways to assays for phenotypic screens approach (here). One of the best examples of this approach is what Vertex did to discover new therapies for cystic fibrosis. The only point to add here is that human genetics can nominate assays for drug screens as well as provide a means to validate the assays as disease relevant (e.g., knocking out core genes or introducing disease-associated variants with large biological and clinical effects). As it pertains to the new Cell manuscript, both core and peripheral genes point to key biological pathways that are relevant to disease, many of which were previously underappreciated. Here is a short list of findings that have emerged from human genetics: complement pathway and age-related macular degeneration; autophagy in inflammatory bowel disease; lysosomal biology and Parkinson’s disease; cellular stress and idiopathic pulmonary fibrosis; synaptic pruning and schizophrenia; microglial inflammation and Alzheimer’s disease. These same genetic studies have also ruled-out pathways that were once thought to be critical in disease pathogenesis: HDL cholesterol and heart disease. (3) Circuit pharmacology. The omnigenic model proposed by Pritchard and colleagues raises important questions: “If most genetic variants act through cellular networks, then what mediates these connections? What is the nature and frequency of long-range interactions in cellular networks? How do network architectures vary across cell types and tissues?” The answers to these questions are only now being formulated in humans, although others have noted that model organisms have provided this perspective on physiology for many years. What I do not yet know is how to turn these cellular networks into actionable information for drug discovery and development. There are certainly extant computational approaches that define networks and nodes, which could be used as starting points for target-based screens or phenotypic screens, as described above. These nodes could also be used as a roadmap to rationally combine drugs that selective modulate individual targets. There are also individual targets that likely have pleiotropic effects on cellular networks. Epigenetic targets (e.g., HDAC-inhibitors) have broad effects on cellular physiology, as do transcription factors that act as master regulators of cell lineages. Therapies that block PD1 allow the human immune system to turn against tumors by unlocking critical checkpoints. Adaptive cell therapies (e.g., CAR-T, pluripotent stem cells) are living systems that can sense and respond to disease states in humans. But more generally, the network model challenges the reductionist way in which most drug discovery is done today. Indeed, the study by Pritchard and colleagues serves as a “kick in the shin” (to quote one of my thesis advisors, Aravinda Chakravarti) for geneticists and drug discovers alike. Accordingly, I believe we need a new area of “circuit pharmacology” that not only defines nodes, networks and connections, but also proposes novel therapeutic approaches to modulate these systems. I use the term “circuit” to differentiate the approach from network pharmacology, which is an established concept. The reason for this distinction is innocent: we need to think about regulatory networks in ways that are different…in ways that I cannot explain today! In conclusion, Pritchard and colleagues posit a new “omnigenic model”, which is an extension of the infinitesimal model proposed by Fisher in 1918. The omnigenic model defines core and peripheral genes as contributing to disease risk, with the majority of heritability explained by variants in peripheral genes acting through cellular networks. Even if a small portion of heritability is explained by core genes or pathways implicated by core & peripheral genes, these insights provide a mechanistic understanding of human disease that is often unexpected or underappreciated. For core genes, I believe that a critical gap is quantitatively determining the biological / functional impact of disease-associated variants. As function-phenotype maps emerge from core genes with a series of disease-associated alleles, more accurate estimates can be made of the effect of target perturbation on human health. Nonetheless, new approaches are required to explore the therapeutic value of perturbing regulatory networks. It is possible that a new field of “circuit pharmacology” will emerge as a result of the hypotheses put forth by Pritchard and colleagues.